Loved by fans and critics alike, the film Aliens set a new standard in science-fiction horror; James Cameron's masterpiece deviated from the haunted-house-in-space idea that made Ridley Scott's Alien, rather creating a war movie sated with tension and raw fear. An amazing storyline made gripping with real, fascinating characters, made terrifying by the thousands of smart horrifying monsters surrounding and preying on them (which, by the way, was only six men in costumes - eat that, terrible overused CGI!) in the claustrophobic space - Aliens is a film that remains powerful even after a dozen viewings. Read Roger Ebert's review, a stunning recommendation of how the film made him feel really bad inside because it was that intense. Pull the Alien Quadrilogy out of your DVD collection and watch it again tonight! McFarlane aquired the Alien film license beginning with Movie Maniacs V, producing a nifty Alien and Predator Deluxe Boxed Set and following it up with a whole series, Movie Maniacs 6, consisting entirely of Aliens and Predators. 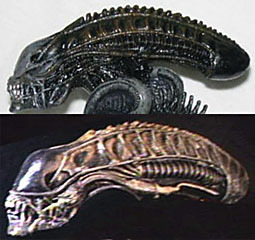 But it wasn't until the rerelease/revamp/repaint line (like a repaint series but also with some new sculpted parts, thus known as an R3, here called "Alien and Predator") that we saw the Aliens Alien in plastic, with James Cameron's alien costume slightly altering Giger's original design, making it more mechanical. But how does the figure fare up? Read on! The Warrior Alien is packaged in a very nice little clamshell, looking appealing enough but somewhat unexciting; part of the awesome Aliens poster adorns the side of the thing and looks very cool, whilst showing off the figure nicely. McFarlane also leads the way with the clamshell inserts, nice little brochures which open up to show off more recent releases and lines, which is all well and good except that they tend not to include instructions for the figure (if it has any), instead choosing to put them online. Annoying! Why the need to run to the PC and find out how to put the toy together when you could just have them with you when you open the plastic? 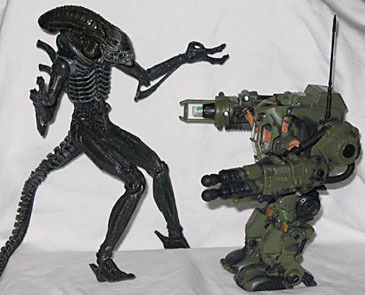 The Warrior Alien is actually an R3 of the original MM5 Alien, with new head, arms and tail, and the sculpt of that head is the most controversial part of the figure. Coarsely debated about on the Spawn Message Boards, the Aliens sculpt looks excellent enough, but isn't quite authentic to the film. Comparison headshots show it off, though by itself, most people aren't going to tell the difference, and with that said, the head looks fine. The entire body sculpt is great, with all the details showed off with the excellent but simple paint, highlighting every little part of the scary design. Size is a slight issue - the Alien is huge, around 8" tall, looming above the Hicks figure nicely, but he's not quite in scale, and should be an inch or so shorter. Sadly, the figure is plenty flawed beyond the inaccuracies and the good stuff. The pose of the Aliens Alien makes it really hard for it to stand, at all - the feet are in strange poses and there's no base for them, unlike the Alien Alien, who can stand much better thanks to the base. So, unless you've got him leaning on something, he's going to topple a lot. Further, the arms and hands are also in strange bent poses (as with all the McAliens) which isn't too bad for display, but it'd be better if they could be articulated to move so rather than being stuck like that permanently. 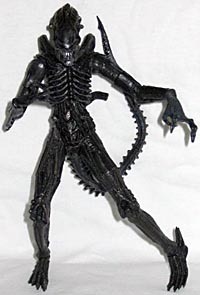 The Warrior Alien has plenty of movement, particularly for a McToy, but it's hindered by the sculpt problems such as the strange bent arms and hands, and that continual inability to stand, rendering much of the limb articulation useless. With balljointed arms, neck, midsection and feet, then pin-jointed knees and peg-jointed upper arms, tail, wrists and legs, he has a lot of movement and some of it is excellent. The neck and midsection articulation is great, as are the balljointed shoulders, but there's some serious improvements to be made. Adding better articulation to the wrists and elbows would make for better poses and play without necessarily disrupting the sculpt (the joints on the arms look particularly ugly, breaking smooth lines of the sculpt) and fixing the legs would mean a vast improvement, allowing him to actually stand. The Marvel Legends-style feet articulation is a decent feature but it doesn't work with the rest of the leg articulation. Fortunately, there is some play value in him, with all that movement and the moving, attacking arms, but particularly the durability - this isn't one of those McToys that'll fall apart in the package. This guy can take some hits and get right back up, making him all the more fun. 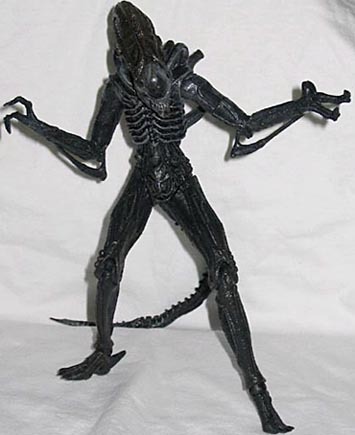 This Alien comes with absolutely nothing, not even love, an annoyance considering the cool egg base and face hugger that's featured with the Alien Alien from this same series, and the fact that both Predators have some kind of cool accessories. That all being said, I still really like this figure, simply because it's a decently done figure of one of the best movie monsters ever to grace the silver screen. Its imperfection is maddening and it's just not as good as it should be, but it's still great for display with other Aliens and has some play in him. 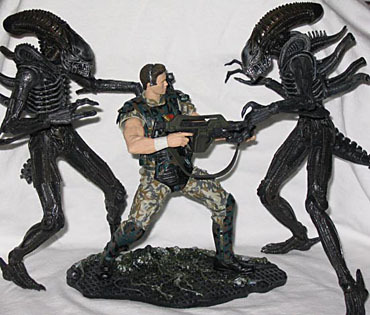 I may be alone in this, but I'd like to see some more Alien figures from McFarlane, with that cool second-mouth action feature and some different head sculpts, better articulation and such, but for now, I'm a happy OAFE with my Aliens. Pants!